Mountains and forests shape the North Country of New Hampshire. The mountains, lofty peaks including Mt. Washington at 6228 feet, the highest in the Northeast, seem to go on forever. And our most famous landmark, the Old Man of the Mountain, was set high above Profile Lake in Franconia Notch State Park. This natural stone profile was carved by nature thousands of years ago and is formed by five separate ledges and measures 40 feet from chin to forehead. 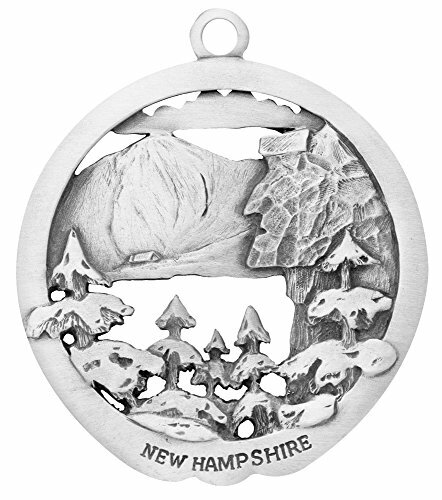 Hampshire Pewter has captured the natural wonders of our state in this special ornament. We invite you to come and see our views and remember New Hampshire, a state rich in history, scenic beauty and warm hospitality.